Panajachel is often nicknamed “Gringotenango” by locals due to the large numbers of tourists it gets annually, and it’s easy to see why it gets so much international attention. This beautiful hippie town has everything a laid back, nature/culture lovin’ expat could want. 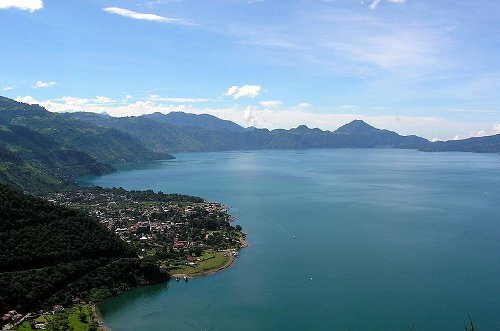 The town is located on the shore of spectacular Lake Atitlán, and it provides a base for visitors crossing the lake to visit other towns and villages. The large volume of tourists give Panajachel an international appeal, though its small population of only around 11,000 maintains its tranquil charm. Packed with hotels, restaurants and a happening nightlife scene, there’s always plenty to do here. The town also boasts a flurry of in-town and nearby attractions. There’re the museums: Museo Lacustre Atitlan, as well as Los Encuentros, a smaller private center dedicated to preserving the local Mayan culture. Not far away is the San Buenaventura Nature Reserve, an extensive tract dedicated to the preservation of flora and fauna native to the Lake basin eco-system. Daily busses to and from Guatemala City make this chillin’ locale easily accessible, and all the smaller towns around the lake can be reached by boats which leave from Panajachel’s pier. But imagine everyday encounters with indigenous shamans, painters, weavers and travelers, swims in the lake and that spectacular weather. We think you’ll want to stay. 60 year old retired African American widow would like info on relocation from the USA to a less stressful and laid back environment, with great people. Tell me about your experience as an expat living in Guatemala? Phyllis in Atlanta, Ga. I am a 63 year old African American woman who has traveled to Guatemala twice in the last 6 months. I have clearly fallen in love with the place. I too, am looking for a good place to be when I fully retire at the end of 2012. Hi. I am an almost 60 year old woman who is visiting Guatemala alone. My traveling friend cannot make it but the trip is booked already. I barely speak Spanish and I am a little nervous. I will be coming into Guatemala on July 29th and would love to have some people to advise me and help me out. I am considering moving there. I’ve seen some homes in Panajachel, but I saw some bad press on that area. Can someone get back to me soon. Thanks. Having lived in Lake Atitlan area for a few months now, I would definitely advise against retirement and especially real estate investments in the area. The lake is beyond polluted and unswimmable, there is raw sewage everywhere, garbage gets burnt rather than collected, produce is seasonal and whatever doesn’t come from the farmers costs a lot more than in the states even. And lastly, the area is geomorphologically unstable, subject to earthquakes and mudslides. Come and live here for 3-6 months and see for yourself, but from all the Central American counties I’ve been to, Guatemala is by far the dirtiest and poorest. I’d advise to look into Honduras, Belize, Panama and Nicaragua instead.